For those who know me best, it will not be a surprise that I always write New Year’s resolutions before the start of the next year! These resolutions are really a set of guiding principles or an opportunity to re-set your intent. I have always believed goal setting is very motivating. While you may not care what my 2015 New Year’s resolutions were, what I learned in the process may offer some insights. Importantly, they also guide our expectations for 2016. Over the past months we have focused each Friday on a different charity. Our Charity Spotlights reinforce our ethos in finding ways to be socially responsible. While we have no new charity spotlight on Christmas Day or New Year’s Day we especially think of all those who are alone, homeless, in poverty and in desperate need. Here is a quick round-up of the charity spotlights we have featured. Habitat for Humanity is a wonderful illustration of those at risk of poverty, the wider community, non-profit and for-profit sectors collaborating together. Habitat for Humanity has expanded substantially from its roots in Georgia, USA, in 1976. It has become a worldwide recognized non-profit driving force both in providing much needed support one family at a time, while also advocating strongly for those at risk of homelessness. In 2011, Habitat for Humanity Canada completed its 2,000th home and has now helped 2,700 families. You can read the last Habitat for Humanity Canada Progress Report here. McKinsey&Company report $44 billion in beyond-the-product solutions in the US alone. Here we explore how multi-national Med Tech corporations can develop health outcome models. Much of the success lies in creating sustainable cultural change owned by the healthcare system. Many non-profit organisations struggle with where to start with Inbound Marketing. 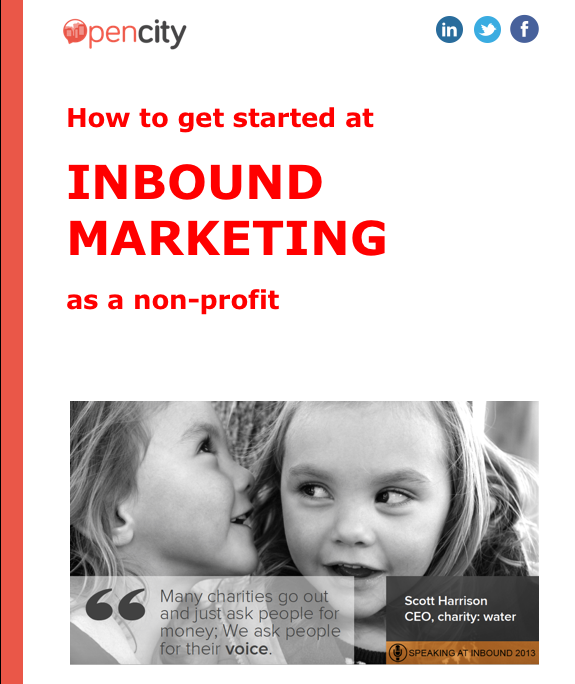 To help meet this need, we have developed this Inbound Marketing introduction for non-profit organisations. This introductory guide has been specifically written to be easily comprehended by non-profits with the first principles of how to raise online presence and authority. Posted in Inbound Marketing, Non-profit, Opencity IncTagged @gregiej, charities, eBook, HubSpot, Inbound Marketing, non-profit, Opencity Inc. Content is King. The Big Issue has remarkable content such that I would buy a copy for that fact alone over other magazines and papers. The Big Issue of course is so much more worthy than that accolade alone. The Blue Sea Philanthropy model appears quite remarkable to me. A why did I not think of that type brilliant idea. Posted in Charity Spotlight, social responsibilityTagged #Giving Tuesday, Blue Sea Philanthropy, Coldest Night, homelessness, Milton Transitional Housing, Opencity Inc.